Apparently I have a thing for spaghetti squash and kale together. I didn't even realize how close this dish would be to this dish until I was halfway through making it. Oops. 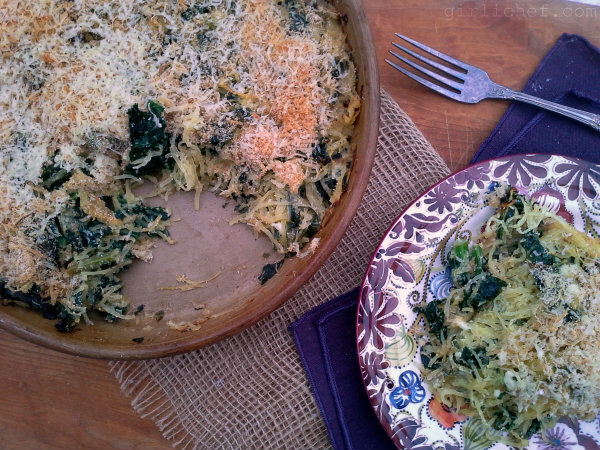 And while, yes, they both contain spaghetti squash and kale and parmesan - they are actually quite different. They don't taste the same at all. Which is strange, because neither dish really contains that many ingredients. I consider that one an entree, and this one a side. 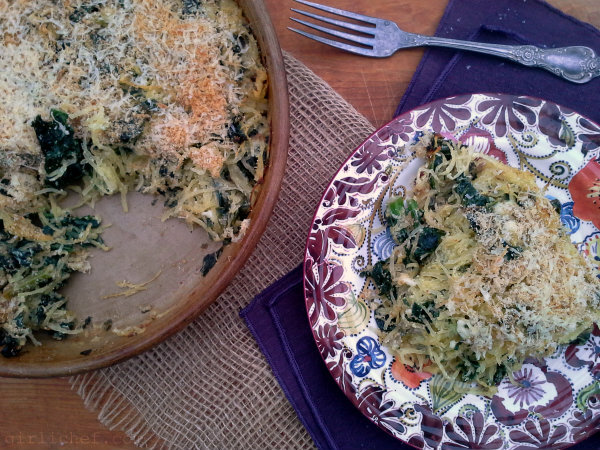 And of course, what is the absolute perfect accompaniment to spaghetti squash? Italian sausage. I mean, seriously, it's one of those perfect marriages. And I didn't even do this on purpose, but I happened to make Italian sausage and red sauce for dinner last night (this was more of an experiment and a separate thought). So while I enjoyed the bite and slight tang of this alone, when it was eaten with a bit of that sausage swirled through it? Money. Now, I can hardly believe that this is our twelfth and final week of the 12 Weeks of Winter Squash. It went by incredibly fast! I want to thank my co-host Joanne of Eats Well With Others for inspiring me to explore the wonderful world of winter squash (and for letting me come along for the ride). This may be the "official" end, but winter squash has earned a permanent place in my kitchen. And I cannot wait until next year! Preheat oven to 350° F. Line a baking sheet with parchment, foil, or a silicone baking sheet. Increase oven temperature to 400° F. Put cottage cheese in a strainer and gently run cold water over it so that you only have the curds. Set aside and allow to drain while you get on with it. Drizzle about one tablespoon of coconut oil or olive oil into a large, deep, heavy skillet set over medium heat. Add onion and saute until translucent, about ~3-5 minutes minutes. Add garlic and fresh herbs (if using) and cook, stirring, for another minute. Add another drizzle of oil, and then add kale and continue to cook for a another 3-5 minutes, stirring, until slightly wilted. No need to cook completely as it will finish cooking in the oven. Combine the cottage cheese curds, sour cream, egg, and ½ cup of the Parmesan in a very large bowl with the chives and green onions; mix to combine. 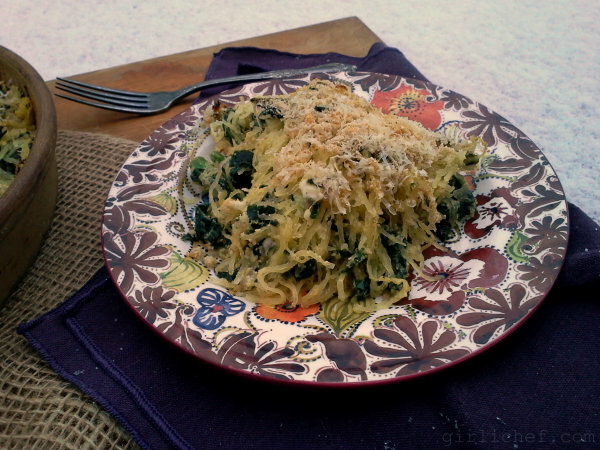 Tip the spaghetti squash into the bowl, as well as the kale mixture. Stir gently until everything is thoroughly combined. Season to taste with salt and pepper. Transfer to a gratin dish or a baking dish that has been sprayed with non-stick cooking spray; distribute evenly and press down. Toss the remaining ¼ cup of Parmesan with the bread crumbs and season with a pinch each of salt and pepper. Distribute evenly over the top of the mixture. And then, if you're like me, grate even more Parmesan over the top. Just because. Slide into preheated oven and bake for ~30-35 minutes, or until the mixture is bubbling around the edges and the topping is golden. If you'd like, you can slide the whole thing under the broiler for a few minutes longer for more color. Serve immediately. You can use any type of herbs that you have on hand (and that you think would taste good in this application); this time I used chives, sage, marjoram, and thyme. And now we'd love to know what you've been doing with winter squash in your kitchen this week... or heck, anytime over the past 12 weeks. Feel free to link up as many winter squash recipes as you like below - we want lots of recipes to guide us through the rest of the season! disclaimer: I received a free coupon to try Cut 'n Clean Greens. I was under no obligation to write about them or use them in a blog post. But I did. And I liked it.